Aioibashi Bridge and Teijibashi Bridge in Hiroshima. In the back, the Hiroshima Prefectural Products Exhibition Hall is visible. 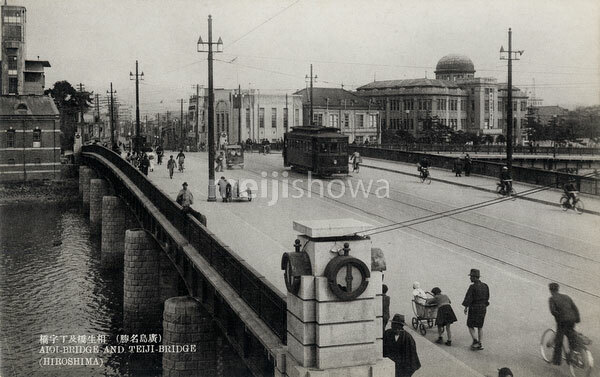 Designed by Czech architect Jan Letzel, the building was completed in April 1915 (Taisho 4). The 6 August 1945 (Showa 20) nuclear explosion that devastated Hiroshima found place almost directly above the building. Now known as the Genbaku Dome (A-Bomb Dome), this Hiroshima Peace Memorial was registered on the UNESCO World Heritage List in December 1996 (Heisei 8).